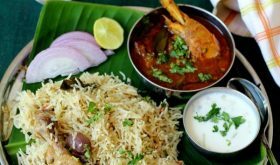 Though Andhra cuisine is reputed for its fiery hot chillis and spicy food, it also offers some popular traditional sweets, for the sweet-toothed, like borellu, arisellu, bobattu, sunni undalu, boondi laddo, jangiri etc. One such sweet is the Kajjikaya, a traditional sweet that is prepared by rolling out small balls of maida dough into thin puris and filled with a mixture of dry coconut, sugar, semolina and cardamom powder and deep fried. Kajjikaya has a light, crisp exterior and as you bite into this crescent shaped sweet, its crunchy texture with the subtle sweet flavor of dried coconut and sugar laced with a tinge of cardamom, stretches into every bite, leaving you very satisfied and craving for more. The sweetness of the kajjikaya is subtle that you can easily have 2 to 3 kajjikayalu without feeling heavy. Kajjikayalu can be eaten anytime of the day and makes a great tea time snack or an after lunch/dinner dessert. 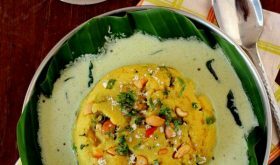 Kajjikaya is similar to the popular Maharastrian sweet ‘Karanji’ which is prepared using mawa (khoya /thickened milk) instead of semolina. 1 Mix the maida with salt, 2-3 tbsps ghee and enough water to make a pliable dough, not too soft. Divide the dough and shape into small balls as shown in the picture. Keep aside covered for half an hour. 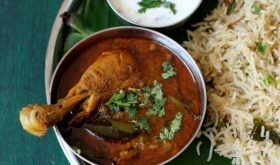 2Meanwhile, heat a pan, add 1 tbsp ghee and add the grated coconut and roast over medium flame for a few minutes, approx 3-4 mts. Remove and keep aside. If using fresh coconut, roast the coconut till golden brown. Ensure that its well roasted, it takes longer time to roast than dry coconut. 3 In the same pan, add 1 tbsp ghee and add the sooji and roast over medium flame till it turns light pink, approx 7-8 mts. Remove, cool and keep aside. 4 Powder the sugar and mix with the roasted sooji, grated coconut, cardamom powder and cashewnuts. The filling is ready. Keep aside. 5 Now, roll each ball with the rolling pin into a thin puri. 6 Spread a tablespoon of the filling on one half of the rolled out dough. Wet your finger and run it along the edges of the spread out dough with water and fold over to the opposite end, enclosing the stuffing to form a semi-circle shaped kajjikaya. Press the ends firmly so that the filling doesnt come out during the deep frying process and twist the edges around the kajjikaya as shown in the picture. 7 Heat enough oil in a wide vessel to deep fry the stuffed kajjikayalu. Drop 3-4 kajjikayalu into the oil slowly and deep fry them till golden brown, turning them carefully to the other side so that it cooks on all sides. Deep fry on medium heat and not piping hot oil. 8 Cool and store in air tight containers. Kajjikayalu remain fresh for atleast a week and can be stored for 3-4 weeks. Its advisable to make the kajjikayalu in batches. Roll out, stuff and deep fry 3-4 kajjikayalu at a time (batch-wise). While preparing the next batch of kajjikayalu, reduce the stove flame and carry out the process. When deep frying the next batch, see that the oil is hot enough to deep fry. Keep the dough covered through out the preparation process. Sugar can be replaced with jaggery (panela). Kajjikaayalu moulds (available in the market) can be used to shape the kajjikayalu after rolling out the puri. 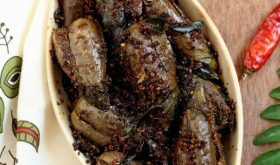 One of the variations for the filling is it to use khus-khus or poppy seeds in place of sooji, roast the khus khus and use. Another variation is to use powdered putnala pappu (roasted chick peas) in place of sooji along with dry coconut and sugar/jaggery. In place of grated dry coconut, roasted and powdered sesame seeds or kova can be used with a blend of cashewnuts,walnuts and almonds. Very nice traditional sweet.In Tamil Nadu also we prepare this sweet. Thanx for sharing. Great display Sailaja! Neat pictures!! If you don’t mind me asking did you change your camera recently? Great pics Sailu. We call it “Nevri” in Konkani. Slurp slurp..
Looks very nice Sailu. I always have hard time rolling out the maida dough thinly like that. It rolls out and springs back. My dough is always too elastic. Let it be baturas, samosa covers, or my favorite snack diamond cuts, I always have a hard time with it. I use extra flour to dust the rolling surface and rolling pin. Should I use oil to get thin sheets? I do make this for Festivals. I love this sweet always. Thank you, Vineela. Its a favorite in our home! You know my mom used to have a special utensil to make the edges frilly. She would press the dough into that and press it and it would form the shape. I dont remember the name now, my mom used to make when we were little. I need to ask her! Its the kajjikaya mould, LG. It gives a lovely frill to the edges of the kajjikaya. Great pictures. I love this sweet. In Tamil Nadu, I think it is called sojji or something. Its a favorite in our home, Mika. Lovely pictures. Reminds me of home. I feel so bad that I dont make all this for my kids. Your recipe has inspired me, I am going to make it this weekend. I am just getting introduced to this blog world! There’s still so much to discover! Welcome to the food blogging world, Latha. You are off to a great start. Those are really tempting snaps…kajjikayalu…they are one of my favourite Andhra sweets….I feel like picking one from u’r snap!! As Latha said your post is so nostalgic. Thanks for sharing this, lovely post and wonderful pictures. This is not fair for you to make me crave my favorite Indian sweet :). It has been more than 5 years since I ate this :). The pictures are soo good :)! And regarding the mould, there was another spoon kinda thing with a circle thing that rotates at the end of the spoon that is used to make the frilly edges. It was not a mould though. Know what I am talking about? Now you’ve made me all nostalgic. As a little kid I could never pronounce the name of this sweet and would call it the “D sweet” because it’s shaped like letter D!!! It’s one of my favorite Indian sweets. I particularly love the one with powdered almond stuffing. Thanks for sharing the recipe. Btw, I’m not sure if I’ve mentioned this before – your new site looks really good. I am so glad you like the new look! I guess but worth the effort. I have eaten so much of this when I lived in Bangalore, and have not eaten this in atleast 15 years. It brought back memories and now I so much want to make this. Thank you for the recipe.I love the pics and step by step instructions. Lalitha, 15 yrs is a pretty long time. I can imagine your cravings for it. Recipe is somewhat similar to gujiya(North Indian) made during Holi. Nice pics. The edges have been twisted so beautifully. Your right Krithika, kajjikaayalu are similar to karanji and gujjiyas. Sailu: Looks absolutely delicious and wish I could grab one. When I look at those ones, I remember a sweet, KOVA KAJJIKAYA brought by my Andhra friend, it is my lost taste since my higher secondary schooling and left me tongue tied. 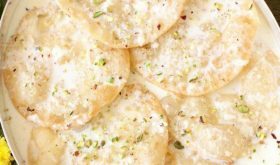 Sailu, have you heard of this sweet and if you know, can you tell me its procedure and … very yummy it is! Beautiful pics !!!!! My mother used to make it once in a while, I was not aware of the place of origin of this sweet stuff. I knew that it is not a Traditional Kerala sweet, loved it a a lot, didn’t really bother to investigate. I wonder if my mother knows about it as well, going to tell her when I ring her up next time. Thanks for the recipe. Your photos are getting better and better day by day. Good job !!!! a popular traditional sweet of Maharastra and is very similar to gujjiyas a North indian sweet. Yes it is Karonji!! Ah! My mom was in Maharashtra for some time and she used to say Marathi words to impress us while making this sweet!! Thank you! I wanted to say “I wanted to wait”, but my taste buds yearn for it. I love to see you blog about it. Take your own time Sailu. Thanks! I’ve tried your version of kajjikayalu yesterday and it was a grand success. This is the first time I am preparing it and am so happy it turned out good. Your pictures are inspirational. I am so happy to hear that the kajjikaayalu were a hit at home, Madhuri. Thanks Sailu, I have been looking for this sweet recipe, I am gonna try it and let u know. Thanks a lot !!! Having lived in Andhra, your pictures brought back shared Diwali celebrations with Andhra friends. Just one thing, we don’t fill karanjis with mava. It’s always with coconut, sesame seeds, etc. I’ve only just discovered your blog and site, thanks! Your pictures are lovely as are the recipes! As people have said earlier, I know them as Karanjis being a Maharashtrian. They are made primarily during Diwali as a part of the faral when usually dessicated coconut is used with lots of dry fruits. Another time they are made are for Narali Poornima, which falls on the same day as Raksha Bandhan. On this day, karanjis are usually made from fresh, tender coconut… though customs may differ. Your photos look great! We call this ‘Somas’ in Tamil Nadu. to cook.I am going cook them now . A suprise for ‘Vinaayaka Chaviti’ for my family. hey sailu this pic of your and many more are copied from your site. pls take action. Thanks for informing me, Sharmi. I hav seen ur kajjikayalu recipie which is very delicious!!! But i really need kova kajjikayulu recipie which my husband likes alot. I prepared kova but i donot know how to make kova kajjikayulu. So, waiting for the recipie. Thank you for the recipie! Ive tried it and it came out really good. Thank you for the recipes you so painstakingly post. I always look for pictures to go with posts and your site has it all. Made the Kajjikayalu and they a hit at my house. My son has been taking it to school for a snack everyday and my daughter who is very choosy when it comes to deserts loved it at first bite. The one thing that was different from what others make was the actual dough, made it so flaky and crisp. Also tried the tomato chutney, cabbage curry and all turned out great. All this to say thanks and look forward to trying more recipes. I made these sweets for RCI : Andhra festival food event, and they turned out really well. It was new to me, but thanks to your step-by-step instructions and beautiful pictures, I could make it easily! Thanks a lot for sharing this recipe with us. I only made enough for 15 sweets, which disappeared fast!! 🙂 Thanks again! I tried this receipe. When i am trying to flip over the kajjikaylu in hot oil, it forming holes or break little , so the powder inside is coming out and it messing all the oil. Any trick for this, please let me know. These are Karanjis ,made in Maharashtra during Diwali!! My mother takes some more effort to make them delicious. For the cover, she adds Sooji to Maida (1:2 proportion) & kneads into not so soft dough (keep aside). She prepares a mixture of Rice flour & ghee (paste). Then she pounds the dough & makes it soft. Prepares big balls out of it. She rolls each ball into a big chapati & spreads the paste over it. Rolls it & cuts it into small pieces. Now from each of them, she prepares Karanji. They have some nice layers over it & they just melt in mouth. I hope u got it & u can try this variation & will turn out best!! I heard about your site from many of my friends. I really like it. I tried your recipe. But the filling became hard, not like powder. I remember in swagruha foods the filling is like powder, not this much hard. What I have to do for that? Thanks. This is the first time I am using ur blog and noticed you have good posting.Thank you for all your posting .I tried kajji kayalu.The shell came out to be soft/soggy.I thought it should be crispy.Should I make the maida rolls very very thin so that they will be crispy when I fry them?Can you suggest me what i need to do to make shell crispy.Thank you. May i know wat I can do with left over stuffing..can u give me idiea? you wright in the ingredients 4-5 tbsps ghee and 2-3 tbsps ghee in method please I want to try your recipe but what is the correct amount of ghee ? I want to know if you can mail the fresh coconut kajjakayalu. What will be the cost. What other items do you make.